If you stand there, you will be fascinated by the sight of the old track disappearing in the pale pink coffin. About 580m in length, about 10 minutes on foot, it is an atmosphere that is likely to trip in another age when you step out. It was built for moving equipment and boats in 1891. Today it is closed due to the decrease in demand for transportation using ships, but it was restored in 1977 to preserve its industrial heritage, and was designated as a National Historical Site in 1996. 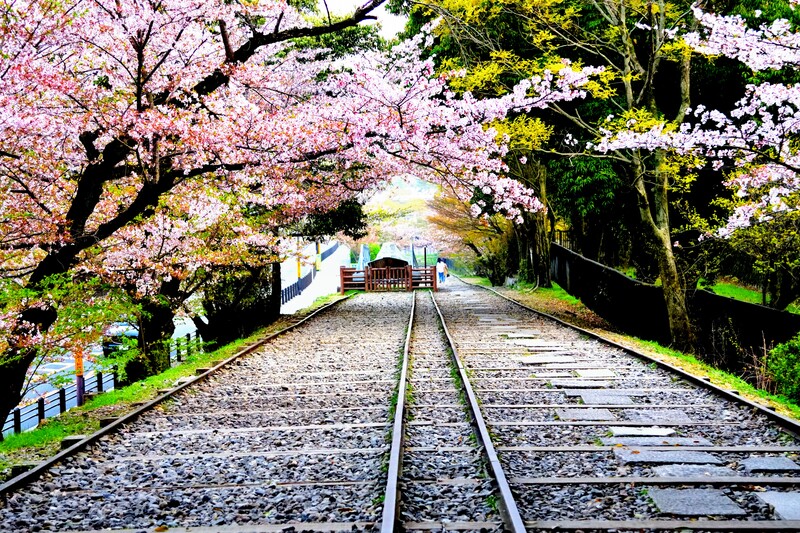 Each year during the cherry blossom season, the Keage Incline shows us a breathtaking scenery, with beautiful rows of cherry blossom trees on both sides of the railroad tracks. Here is a peek at what you can see during a walk along the Keage incline. It is located near the Nanzen-ji Temple in Higashiyama. The 90 cherry trees are usually in full bloom from late March to early April every year. This type of experience is rare in Japan, so it is widely used as a place to take beautiful wedding photos. The Keage Incline in the spring shows a different face every day. It’s a great experience walking along the tracks covered with cherry petals. During the cherry blossom season there will be a lot of traffic, and there’s no parking at the Keage Incline, so it’s better using public transportation. It is located a 3-minute walk from exit #1 of the Keage Station on the Tozai Line of the Kyoto City Subway. Nanzenji was built as a temple of prayer for the prosperity of the country. It was built by Emperor Kameyama in 1291 during the Kamakura period. It is one of the most popular locations to see the beautiful cherry blossoms in spring. There are about 200 cherry blossom trees in Nanzenji. Tetsugaku-no-michi and Heian-jingu, which are famous for their cherry blossoms, are near Nanzenji, so it is the best location for tourists who want to enjoy the cherry blossoms. The beautiful autumnal colors can also be enjoyed at Nanzenji temple.